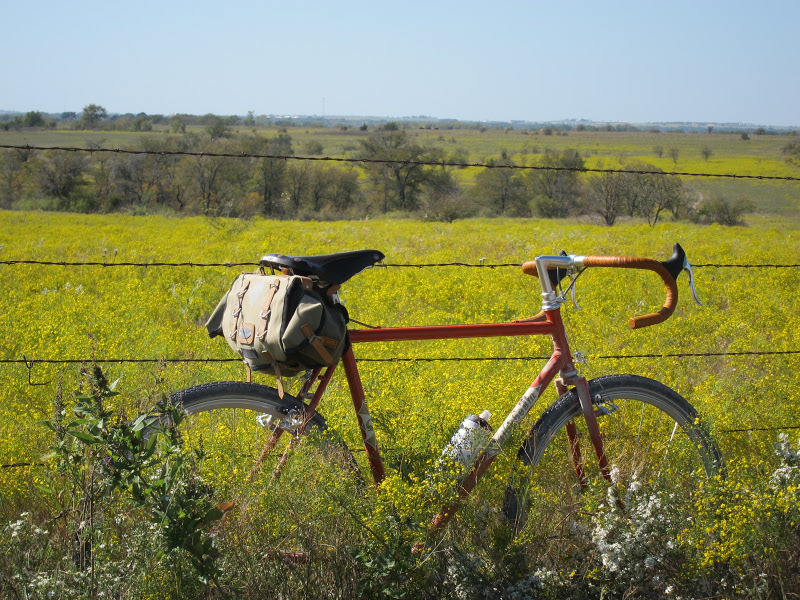 Sometimes I think I should have named this blog “Bikes and Barbed Wire”. 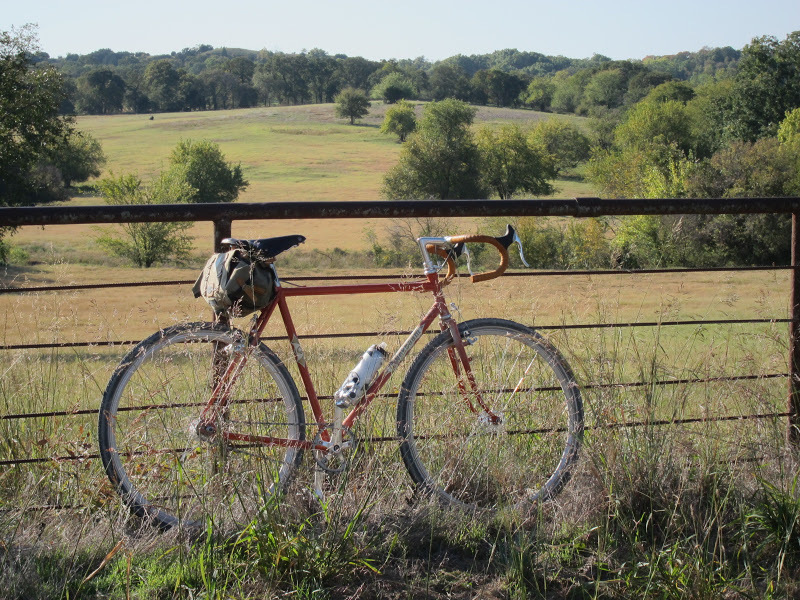 It seems like 90% of my photos involve one of my bikes leaning against a barbed wire fence. I apologize to those who long ago grew bored with my primary subject matter. But until I get tired of it, I guess we’re stuck with it. Perhaps there is more to be done with a bike and barbed wire, and I’m just the guy to figure it out. I’ve been seeing this guy a lot lately on one of my frequent routes. He’s hard to miss. 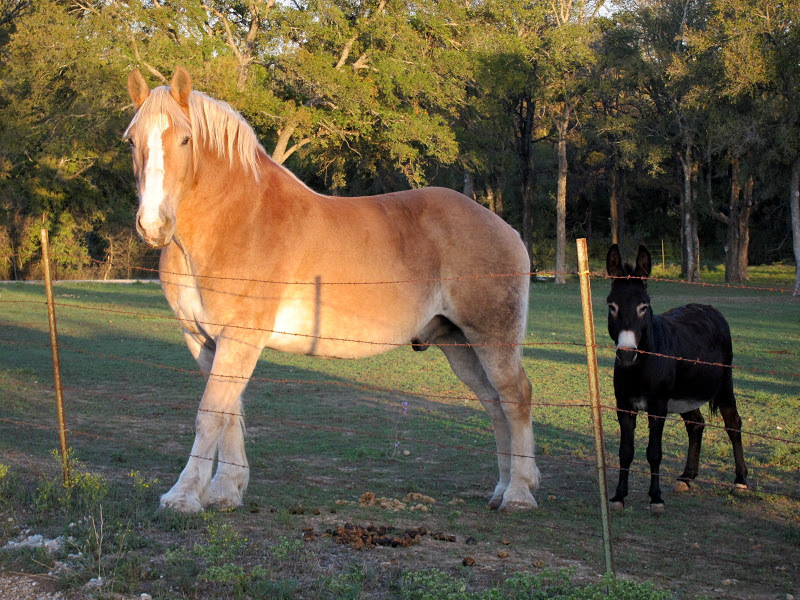 Maybe when I’m too feeble to ride a bike, I could get a fine, strong horse like this one to pull me in a wagon down gravel roads. Maybe I’d pose the wagon against barbed wire fences in four counties. In addition to bikes and barbed wire, I seem to have developed quite an appetite for fixed gear, mixed terrain metric centuries. 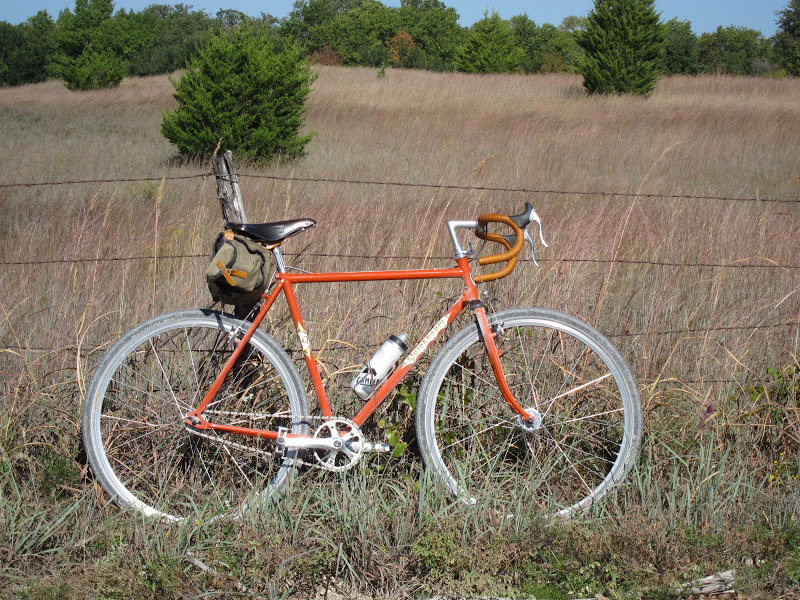 I’ve got a nice, geared randonneur bike with plush 650b x 42mm tires, but I’ve been grabbing the Quickbeam lately. It’s slower and harder, but I do it anyway. I’ve been pondering this, and have a few ideas. But, honestly, I can’t explain it. 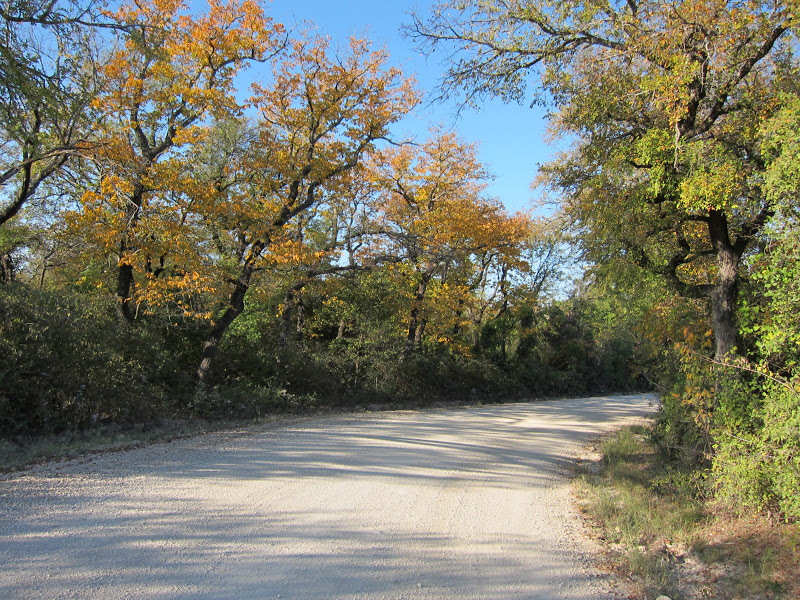 We are beginning to see a few colorful signs of the autumn season in north Texas. We’ll never have the gaudy, over-saturated red or yellow forest like other locales. Instead, we have a tree here and there with stand-out color. Even then, the bright colors are mixed in with a more tasteful balance of tree trunk for strength, and variations in color for a more interesting texture. We love our fall foliage just like the rest of you. 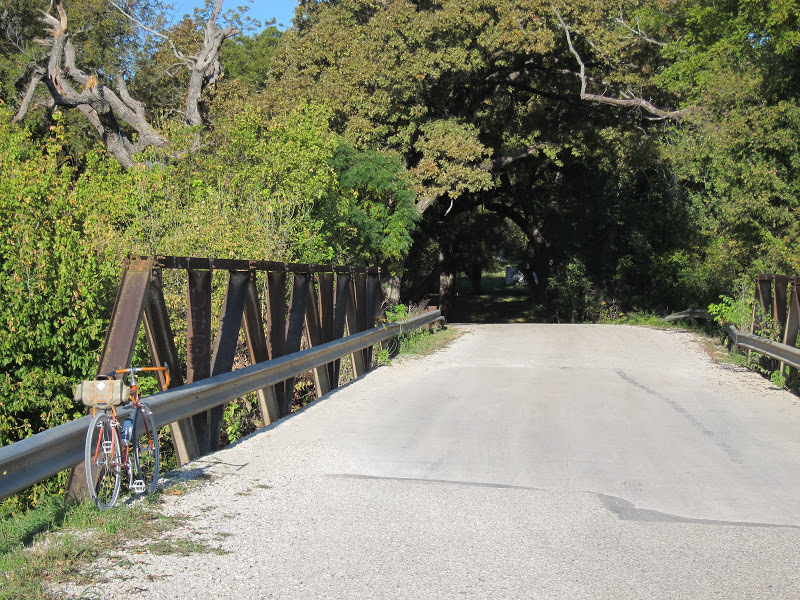 There’s probably barbed wire in this photo, but no bike. Across the street from the Grocery and Grill. Can you imagine a bunch of bikes parked here, leaning up against all kinds of things that are not barbed wire when this year’s Ramble passes through here? 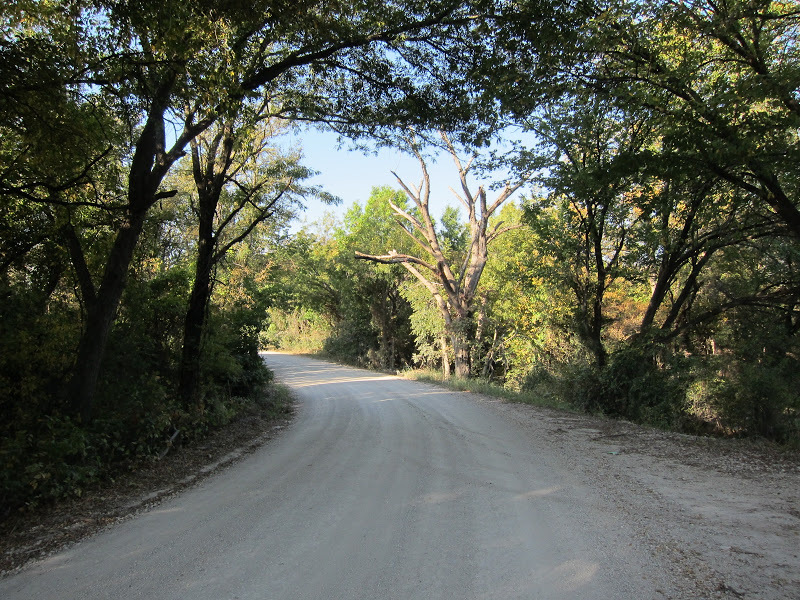 And all the cyclists enjoying the camaraderie of pedaling rural roads. I can, and it looks delightful. North Texas is flat. 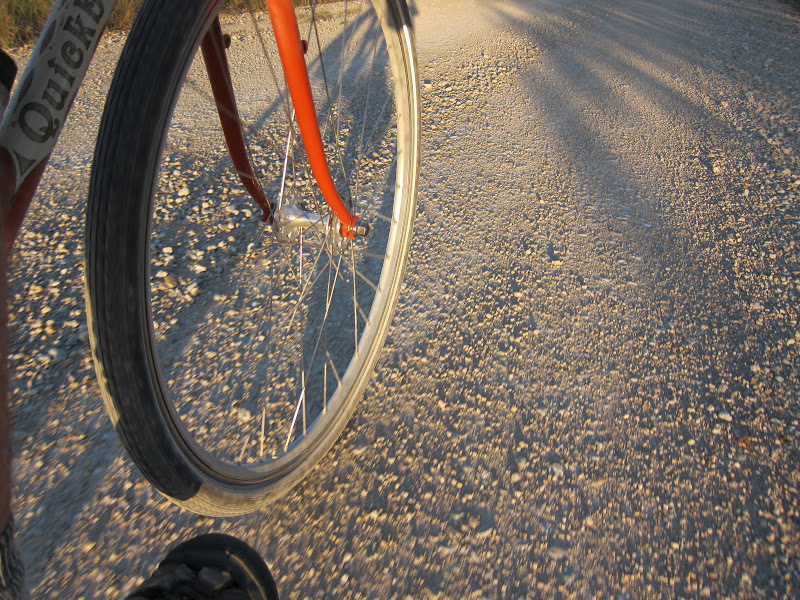 But occasionally, I have to stand on the pedals, pull on the bars, and gasp for air. I don’t know why. I must be old or something. Did you notice that this fence is not barbed wire? Yeah, a crazy experiment, and it caused me a little discomfort. I think it came out okay. This is the first place I can see the Wise County courthouse, sitting on top of the hill in Decatur, Texas. It’s that little spike on the horizon in the opening between the trees (behind the barbed wire fence). In a little while, I can stop at the donut shop, buy a fresh sausage and cheese kolache (wikipedia says technically what I had was a klobasnek, most of us Texans aren’t so technical), and look across the street at that same courthouse. 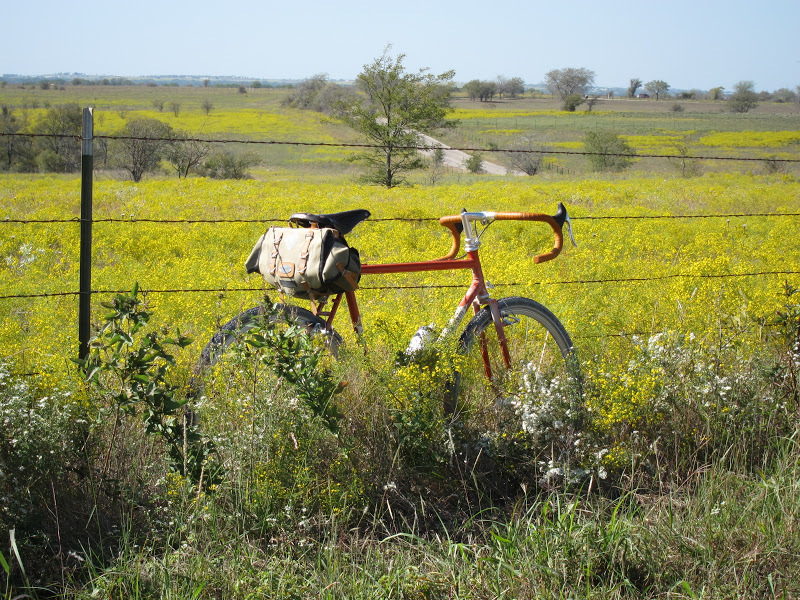 Well because I know you’ve been missing the bike and barbed wire, I close with two classic Pondero photos. This one has some of that awesome, thousand shades of brown, shoulder high prairie grass blowing in the wind. And finally, just another bike, leaning against a barbed wire fence. Because, …well…I guess that’s just what I do. Lovely post. Nothing wrong with leaning your bike on a barbed wire fence. I think I'll try it myself tomorrow morning. You've got barb wire in Scotland? I thought that was just a Texas thing (and of course in the Texas suburbs of Oklahoma and Wyoming)Howdy Fly!! You could have stuck your bike in front of the horse… then you could have been a "bikes and barbed wire and farm animals" guy.I get that fixed and fairly far thing. I have had precious little opportunity to do longer rides over the last few years, but those I first managed were on the fixed. It was just good somehow, as you say. Personally, I like "Devil's Rope" better than "Barbed Wire." Somehow it is less industrial. You're doing great stuff, Pondero, barbed fixations or no. Keep 'em turning and keep posting! I always enjoy reading and viewing your posts! This post, though, makes me think of a "general overview" of the Pondero riding experience. 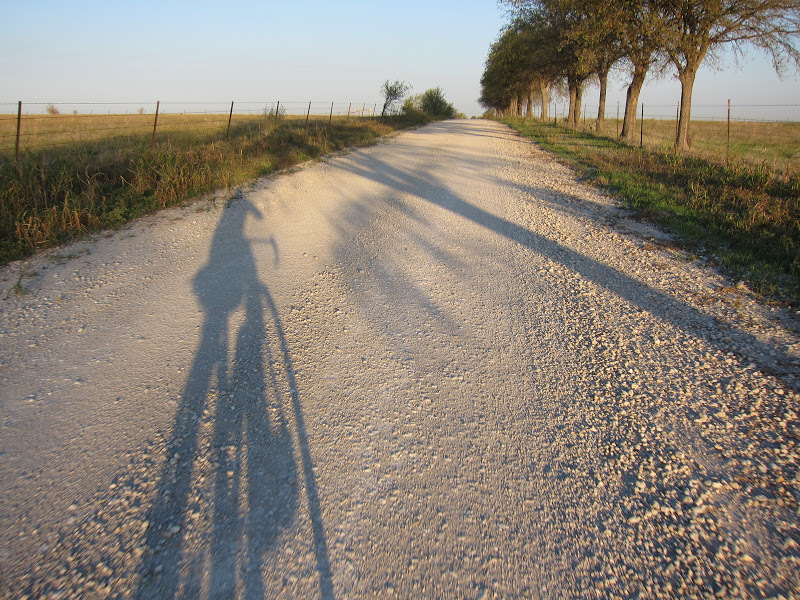 Your photos are beautiful and make me feel, at least a little, like I'm riding down that road, too (sans the crackle of the small bits of gravel under my tires). 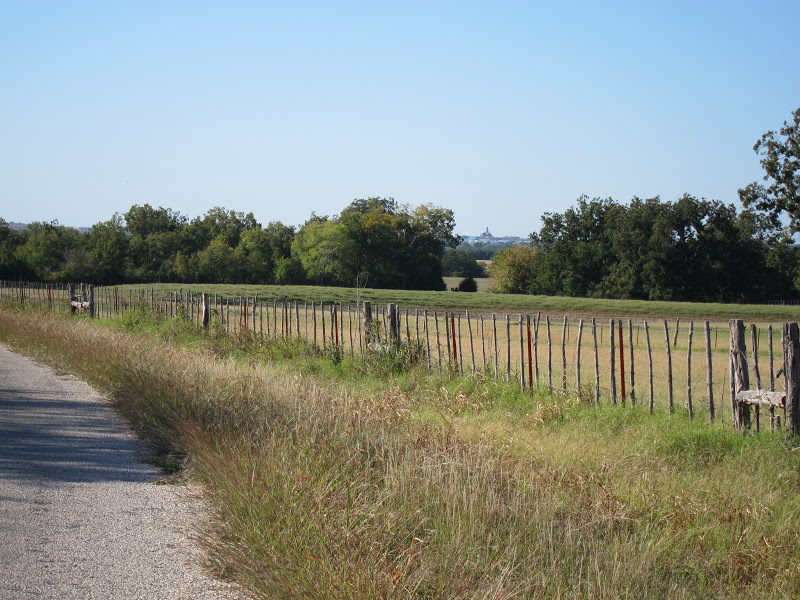 Though we have miles and miles of barbed wire here in S.W. 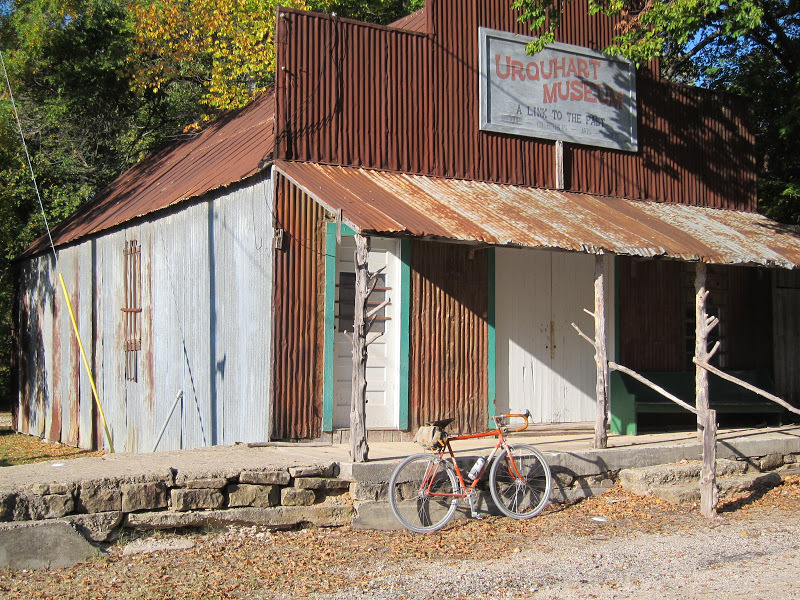 Missouri, I sometimes dream of what it would be like for there to be none to and be able to ride unrestricted on dirt trails across country. I hope to ride the Fall Ramble and enjoy the Pondero experience first hand! I hear you on the barbed wire! It's like black farm fences here in Kentucky. Try finding a photo on my blog without it! Gravel, donuts, QB, donkeys, kolaches, metrics, country stores. Can't really ask or much more.